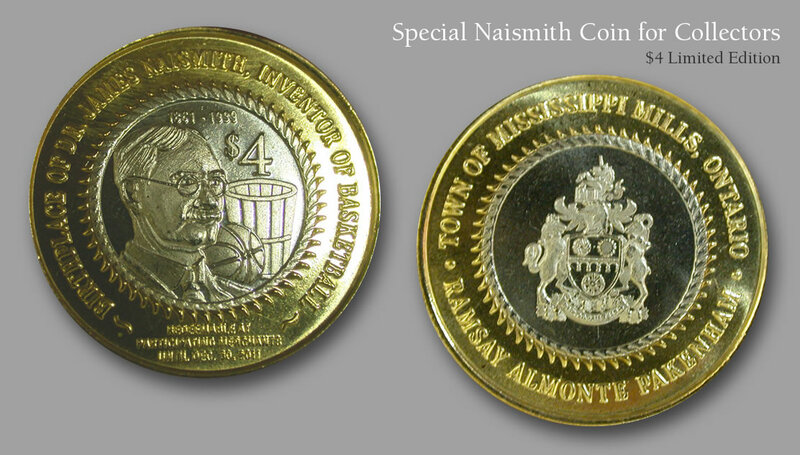 This limited edition coin commemorating the 150th anniversary of the birth of Dr. James Naismith was designed and minted by Alliance Coin & Banknote here in Mississippi Mills. Measuring 1.25 inches in diameter, the coin is minted from brass and nickel. The municipal $4 token was issued in 2011 and accepted by participating outlets during the anniversary year. The token comes in a protective sleeve with artwork depicting the emblem of the Town of Mississippi Mills, the modern municipality which includes Ramsay Township, Almonte and Pakenham. Click here to purchase your Naismith coin.